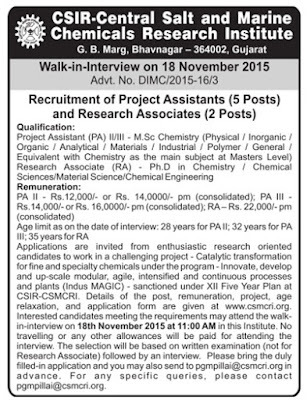 CSIR - Central Salt & Marine Chemicals Research Institute (CSMCRI), Bhavnagar published Walk in Interview notification for below mention posts. Ph.D. (in Chemistry / Chemical Sciences / Material Science / Chemical Engineering) with at least one research paper in Science Citation Indexed (SCI) journal as per HRDG guidelines. Selection Process: Selection will be based on written exam / interview. How to Apply: Interested candidates may reach their for interview with prescribe format along with all relevant certificates to given below address. Candidates also send your application with duly filled application to pgmpillai@csmcri.org.in in advance.